Thanks to “Fighter Sweep” we have this following news story about the two U.S. military aviation demonstration teams’ exhibition over NAS Pensacola, Florida, home of the Navy’s principal Flight Training Station. See the below 1:11 long video. You may ask, “what’s it mean to swap paint?” The video explains. And why were the Thunderbirds joining up with the Blue Angels? It was the 71st Birthday for the Blue Angels, and the USAF Team crashed their party. They hadn’t done this since 2002. But it was a friendly exchange of not just greetings and airborne teamwork, but also of ideas and mutually similar experiences in the crowd thrilling exhibition business. For the “younger” Thunderbirds, it was their 70th birthday. This video is 1:53 long. 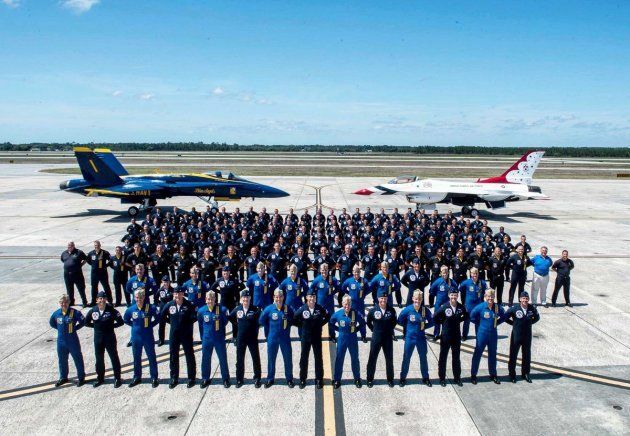 Air Force and Navy Flight Demonstration Teams join for group portrait at Pensacola, FL in celebration of the Blue Angels’ 71st Birthday. Earlier, here below, is a USAF KC-135 Tanker refueling the Navy’s Blue Angels exhibition team in mid-flight. This clip is 1:01 long, and shows some beautiful footage of the refueling action as it takes place. One of our more active FASF members, Col. Alan Fisher, accumulated many hours flying this same tanker during his USAF career. This entry was posted in AVIATION NEWS, HOT NEWS!, NEW VIDEOS and tagged 70th for Thunderbirds, 71st Birthday for Blue Angels, Blue Angels, Col. Alan Fisher, Fighter Sweep, KC-135 USAF Tanker, NAS Pensacola, Swap paint, Thunderbirds, USAF, USN, USN Aviation Training on March 29, 2018 by FASFRIC.